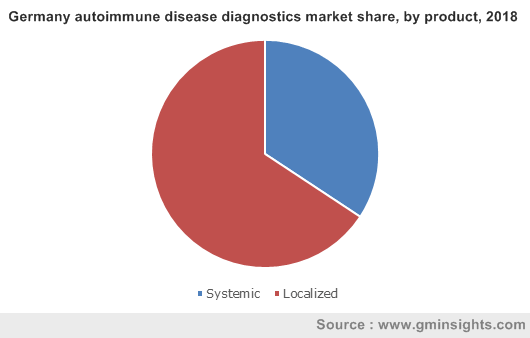 Autoimmune Disease Diagnostics Market size was valued over USD 13.0 billion in 2018 and is expected to witness 2.8% CAGR from 2019 to 2025. 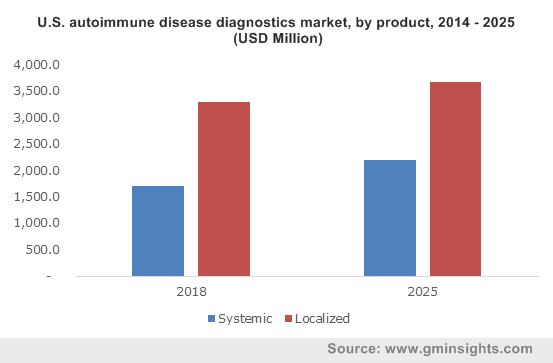 Rising prevalence of diseases such as rheumatoid arthritis, Hashimoto’s thyroiditis, and presence of favourable government regulations will render significant impact on the autoimmune disease diagnostics market growth. As per the American Autoimmune Related Diseases Association, around 50 million Americans currently suffer from autoimmune related disorders. Moreover, the numbers are expected to escalate over the forecast period. The demand for better and precise diagnostic methods, along with the increasing prevalence, is expected to increase over the forecast period. Autoimmune diseases are poorly understood. The extensive research and development activities supported by government are aimed at developing superior diagnosis and treatment methods. Such research activities will further boost the market growth. Several initiatives to reduce the cost pertaining to the control of these diseases will stimulate the business growth over the forecast years. Autoimmune Research Network (ARNet) and the Johns Hopkins Autoimmune Disease Research Centre are some of the organizations carrying research activities in this field. The organizations are working with aim of developing the different strategies to address the increasing economic burden. American Autoimmune Related Diseases Association is the organization that conducts number of initiatives for increasing awareness pertaining to the benefits of early diagnosis. Localized segment accounted for largest market share in 2018 and will grow at an approximate CAGR of 2.1% over the forecast timeframe. The prevalence of localized autoimmune disorders that includes Hashimoto's thyroiditis and type 1 diabetes is steadily increasing. Burgeoning prevalence coupled with rising awareness among the patient will further drive the segment growth. Systemic segment will witness robust growth with CAGR of 3.9% during the forecast timeframe. The systemic diseases are difficult to diagnose. However, due to the continuous research activities and increasing awareness levels, the diagnosis rates are expected to increase in the future. High prevalence of rheumatoid arthritis is a major factor driving the segment growth. The disease predominantly affects elderly patients. The aging population coupled with technological advancements in immunofluorescence and proteomics technologies will further enhance the rheumatoid arthritis diagnosis influencing the segment growth. U.S. accounted for largest market share in 2018 owing to the high and steadily increasing prevalence of rheumatoid arthritis and systemic lupus erythematosus. Autoimmune diseases cause significant economic burden in U.S. and are one of the top leading cause of death in female children and women of all age. As per the latest NIH estimates, these diseases affect around 23.5 million Americans which is very high compared to the cancer that affects 9 million and heart disease that affects 22 million. UK dominated the European market in 2018 and the trend is expected to continue over the forecast period. High research and development activities coupled with increasing economic burden of the autoimmune disorders in the country will influence the regional growth. 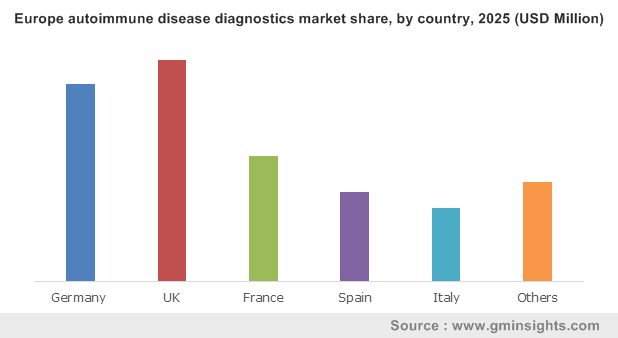 Furthermore, increasing demand for the better and accurate diagnosis of the systemic as well as localised diseases will positively impact the market. Asia Pacific is poised to observe significant growth during forecast period due to presence of large patient pool and rising disposable income in emerging economies. Moreover, the awareness pertaining to the benefits of early and accurate diagnosis is growing in the region. Infrastructural development and increasing healthcare spending in will propel the Asia Pacific market growth. 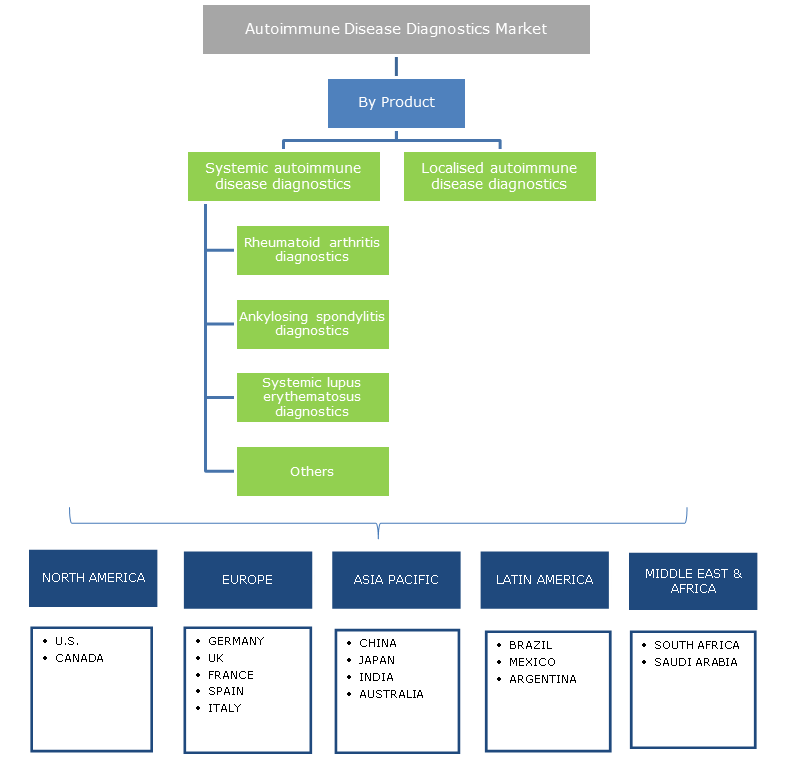 Some of the players in global autoimmune disease diagnostics market are Abbott Laboratories, Siemens AG, Beckman Coulter Inc. and Quest Diagnostics. Innovative product launch and expansion through strategic partnership are foremost strategies adopted by the players to garner higher market share. Other active players in the market include SQI Diagnostics, Bio-Rad Laboratories, Inc, EUROIMMUN, AESKU Diagnostics, Inova diagnostics Inc. and bioMerieux SA. New industry players are trying to leverage the lucrative market opportunities in emerging economies. Increased funding for research and presence of favourable government initiatives will drive industry growth over the forecast timeframe. Moreover, the government and other organization are taking efforts to increase the awareness that is expected to boost the demand for superior diagnostic methods. The industry is expected to witness tremendous growth in developing countries due to the economic development, increasing healthcare spending and rising disposable income.